Look Sharp, Sconnie - Midwestern Fashion Nerd, Chronic Over-thinker: From Work to Weird. I wish I didn't do it. I wish I could say that when I went to work, I dressed completely as I pleased. True - "as I pleased" might mean "please leave", or at the very best a nice bit of intra-office shunning. But at least I'd sleep easy knowing that my outcast state was a direct result of my steadfast conviction to my truest of selves. Then again, I'm not quite sure why that would make me sleep easy. Anyhoo, I wish I didn't do it - but I do. I tame myself down. And even though I'm perfectly aware that in the quotidian sea of navy, black and denim, my little get-ups seem anything but tame, if they only knew what I really wished I could be wearing, they'd be even less inclined to accept my strange aesthetic. Well, folks! You're in luck! Because today is the day that I display my inner most wardrobe wishes. Ta da! From Work to Weird. I've been wanting to do red & maroon (/merlot/burgundy/oxblood) for a while now, but the leaves changing colors and the epically surreal sunsets of late finally propelled me into real action. To work: a mildly appropriate ensemble consisting of pieces unsuited for Capitol Hill but fairly fitting for a Midwestern place of employment. To weird: a not-at-all appropriate ensemble, unquestionably unsuited for offices the world over. ok. Bye fer realz now. I LOVE this outfit maroon and red look SO good together. also loving the animation. you look so lovely in red!!!! xO! You're so cute! I love both looks but I'm obsessed with how you styled the second! Those boots are lovely!! I love all these outfits! You truly did an amazing job styling here! hahaha this was too funny. May I suggest a change in profession? You could almost get away with wearing anything when you work in design, usually the weirder the better. 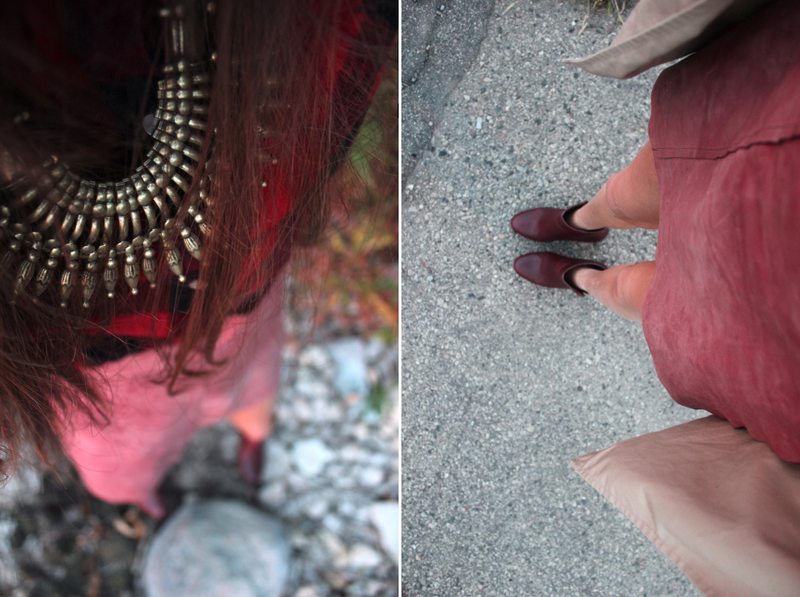 I do love your red and maroon combo, tonal dressing definitely speaks right to me. How amazing are those sunsets?! you have some seriously great moves, both in a sartorial and boogie sense. the work outfit is so cute, i love how you mixed reds and rocked that amazing tribal necklace. you played their game but by your own rules or something. or at least that would be the tagline for the movie based on your office. i LOVE that pink circle skirt in the second look, that silhouette is quickly becoming my favorite for fall!